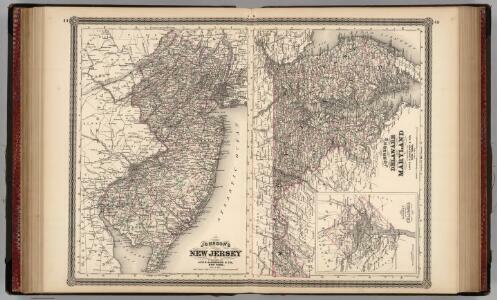 North America: sheet VII, Pennsylvania, New Jersey, Maryland, Delaware, Columbia and part of Virginia / published under the superintendence of the Society for the Diffusion of Useful Knowledge; J. & C. Walker, sculp. from Cartographic materials from the Emmet Collection of Manuscripts Etc. Relating to American History. Delineatio Pennsilvaniae et Caesareae, nov. occident seu West N. Iersey in America / Jonas Silfvorling sculp. Up. 1731.
from Dissertatio gradualis, de plantatione ecclesiae svecanae in America : quam, suffragante ampl. senatu philosoph. in Regio Upsal. athenaeo, praeside, viro amplissimo atque celeberrimo mag. Andrea Bronwall ... in audit. Gust. maj. d. 14 jun. an. MDCCXXXI / examinandam modeste sistit Tobias E. Biörck, americano-dalekarlus. Map of Pennsylvania, New Jersey and Delaware compiled from the latest authorities. The tourist's pocket map of Pennsylvania: exhibiting its internal improvements, roads, distances &c. / by J. H. Young; D. Haines, sc. The tourist's pocket map of Pennsylvania: exhibiting its internal improvements, roads, distances &c. / by J.H. Young; D. Haines sc. A new mapp of East and West New Jarsey. Map of the states of Pennsylvania and New Jersey / engraved & printed by Fenner Sears & Co.
Pennsylvania / by David H. Burr; W. Harrison, sc.